Attendants to PERUMIN 33 can find lodging in IIMP mini-site. Lodging, previously verified, will be located in different strategic points of the White City. In order to give the participants the opportunity to choose the best lodging option and enjoy a nice stay during PERUMIN 33 Mining Convention, the Peruvian Institute of Mining Engineers (IIMP) has created a modern mini-site with a vast supply of rental spaces located at different strategic points in Arequipa. In the context of PERUMIN 33 Mining Convention to be held from September 18 to 22 in Arequipa. On September 21, 2017, the Peruvian-German Chamber of Commerce and Industry (AHK Perú) will organize a technical workshop named “Innovation and Process Optimization” in the context of PERUMIN 33 Mining Convention International Meeting. Over 10 hectares of UNSA will be occupied by PERUMIN 33 and EXTEMIN fair. 68,000 participants are expected at PERUMIN 33 and EXTEMIN fair to be held from September 18 to 22 in the White City. 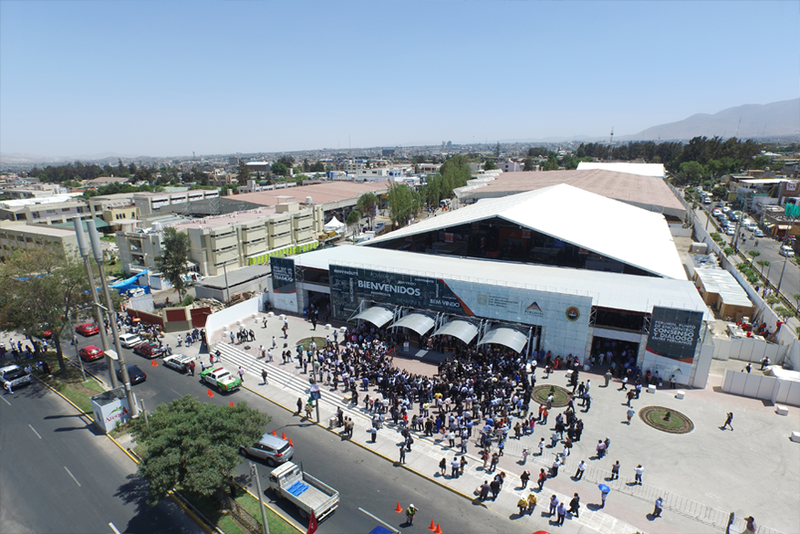 The campus of Universidad Nacional de San Agustín (UNSA) of Arequipa will be, for the second time in a row, the venue for PERUMIN Mining Convention, one of the most important mining meetings in the world. For this 33rd edition, the event will take place throughout 10.3 hectares of the university facilities. As of today, the infrastructure of this venue is being revamped. Homero Muñoz: “PERUMIN 33 Mining Convention will be the beginning of new alliances. Part of the OM360 integral services is the comprehensive development of fair stands. OM360, a company specialized in 360 marketing services and publicity, is getting ready to manage new alliances in PERUMIN 33 Mining Convention to be held from September 18 to 22 at the campus of Universidad Nacional de San Agustín (UNSA) in Arequipa. Homero Muñoz, executive director of OM360, pointed out that their services aim at providing their clients with everything necessary for their stands as they require. Luis Marchese, chairman of the Mining Business Summit of PERUMIN 33 Mining Convention gave us some details about this opportunity for dialogue and analysis. We talked to Dr. Luis Marchese, chairman of the Mining Business Summit to be held in PERUMIN 33 Mining Convention in Arequipa. He pointed out that preparations are being made and that the main topics will be competitiveness and sustainability of mining in Peru. Another important topic will be the frontal fight of companies against corruption. Stated by Jorge Pancorvo, Chairman of the Logistics Meeting of PERUMIN 33 Mining Convention. In PERUMIN 33 Mining Convention, the need of more competent and cutting-edge supply chain will be analysed to maximize the domestic mining sector. Dr. Jorge Pancorvo, Chairman of the Logistics Meeting, pointed out the key role of the mining logistics professional to attain this objective. Said Yolanda Laumer, president of the Integration Meeting (known before as Accompanying Persons’ Program) at PERUMIN 33 Mining Convention to be held in Arequipa. Last April, Peru and Switzerland signed agreements to support artisanal miners, improve public finances and climate change. By doing so, they reaffirmed their willingness to consolidate even stronger political, economic, commercial, cultural, and cooperation bonds between these countries. The IIMP will present four economic studies during PERUMIN 33 Mining Convention. The mining event will gather 68 000 participants and 04 economic studies to be discussed. Peruvian mining is again in a good time, thanks to the recovery of metals price. A proof of this is the mass response to the 33 edition of PERUMIN Mining Convention, one of the most important mining events in the world that will be held from September 18 through 22 at the campus of the Public University of San Agustín of Arequipa. Arequipa people may offer lodging to the attendants to PERUMIN 33 until June 30. Finland is the leader in sustainable mining and will be present in PERUMIN 33. The Government supports the development of PERUMIN 33 Mining Convention in Arequipa. CCIA: “Arequipa is ready to meet the requirements and needs of the Conventionists”.